This ski & yoga retreat is about getting inspired and having a good time with other amazing ski folks like you! Tune in to all the beauty of the arctic: the northern lights, the pristine alpine and the fjords. This ski retreat takes place at 68°N in the beautiful and wild Lofoten islands, in Norway. We will be based out of a comfortable and cozy cabin and start each day with a awakening yoga practice and a healthy breakfast: fuel for the body and soul. We spend each day touring the region on skis, from ocean shore to mountaintop – the possibilities are endless. After skiing, we nourish ourselves once again, with a relaxing yoga practice to soften the muscles and enjoy a yummy gourmet dinner. Join for a fun celebration of alpine sisterhood/brotherhood in an inspiring environment – mountain folks unite! This is a unique ski tour in an idyllic setting; this retreat is about getting inspired and share it with other mountain people alike. Tune into yourself and get fully immersed with the Norwegian landscape and culture, where mountains meet the ocean just above the arctic circle. 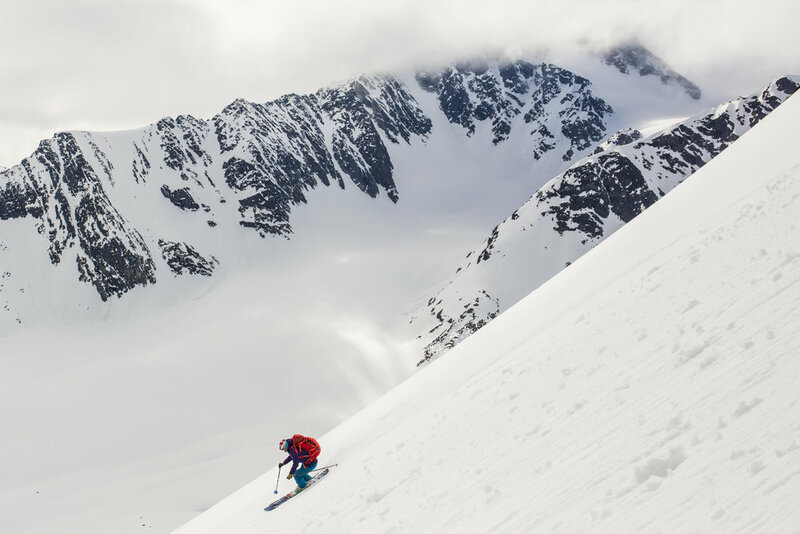 This is more than just a ski trip, its combining a holistic wellness approach with the backcountry experience and using the unique Lofotens nature as inspiration. Late afternoon pick-up in Svolvaer airport, Lofoten Islands. A short drive to our cabin in Svolvaer for a meet and great. Welcome dinner is served and we go over the week’s agenda. We will spend some time in the evening for a detailed avalanche safety and rescue training, to maximize our following ski days. We will start the day with an awakening yoga practice before we we head out for our first day of skiing. We will spend some time for avalanche safety and rescue training, followed by our first of many peaks. Our average daily vertical ranges from 1000-2000m, depending on the group and conditions. For those that want more we can go until your legs say stop: lack of daylight is not a threat up here, as the midnight sun barely touches the ocean before it rises again. Upon return to our cabin, we will relax our bodies with a nourishing yoga practice yet again. Skiing above the ocean and granite series of Lofoten Islands, ski locations accessed by short drive from our base in Svolvaer (anywhere form 10-45min drive to our schoosen location). Throughout the week our guides take the opportunity to visit new places, giving us the grand tour of their incredible backyard, from glaciers to snow covered peaks, all without losing sight of the ocean below. We leave this arctic paradise with renewed passion and gratitude for an adventure shared with new friends before we departure for the airport. Located at 68° North, Lofoten Islands have a great combination of long days and cold arctic powder in March and April. 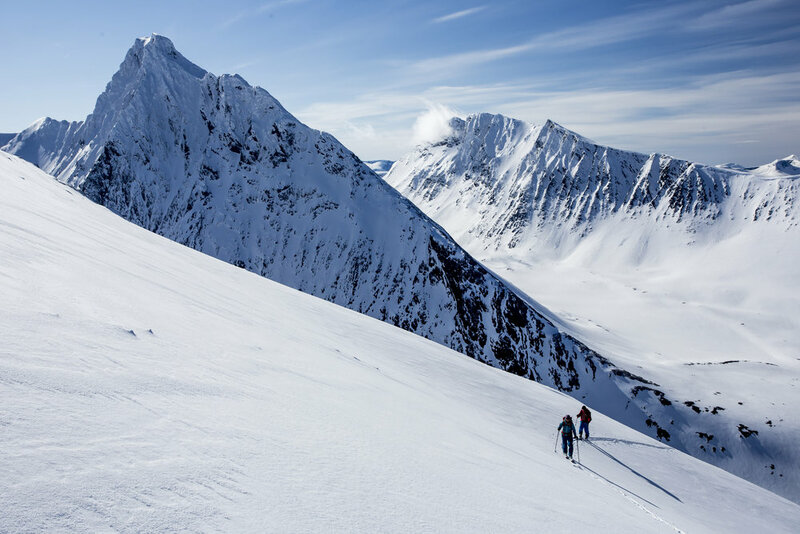 Ski from mountain peaks to the sea under the Midnight Sun, ski touring in the Arctic Circle is a truly unique experience. This retreat is designed for people with some ski experience. You should be comfortable skiing blue (intermediate) and black (advanced, expert) ski runs and have a good level of fitness (ability to walk up while for 2- 4 hours). However, no backcountry skiing or yoga experience is needed. Transportation during the retreat, including pickup and drop-off at the airport at the start and finish of the retreat. Avalanche awareness session on the first day.